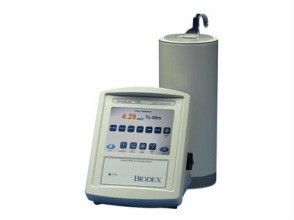 The Atomlab 500 can be used for a wide variety of nuclear medicine, PET and radioimmunotherapy applications, with proven performance for fast, accurate measurements.The system consists of a low pressure ionization chamber, electrometer with extraordinary linearity and an auto-ranging color touch screen display. One dose calibrator can be used for a wide variety of nuclear medicine, PET and radioimmunotherapy applications. Additionally, there are advanced, but easy-to-use programs for nuclear pharmacy, radiochemistry and radiochromatography. Activity measurements are performed by the microprocessor controlled electrometer located within the chamber assembly. The chamber is shielded with .25" (6.3 mm) lead. It can be located up to eight feet away from the display unit. Chamber bias is generated by an electronic high voltage supply, eliminating the need for expensive battery changes. Every element of the design and technical development will increase dose accuracy, department productivity and regulation compliance. The attractive and intuitive human interface guides the user through each operation. 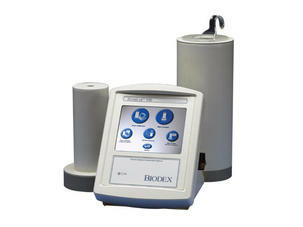 Software can easily be updated via the Biodex website or by using a convenient memory card. 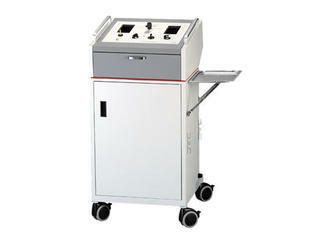 The touch-screen display can rest on a bench or mount on the wall of a hot lab, hot cell or laminar flow hood. In addition to powerful self diagnostics, the Atomlab 500 includes an exclusive chamber monitoring technology to assure longer life and accuracy. Integrated pressure and temperature sensors feedback data so that the influence of gas pressure change will not effect an accurate reading. Combine the Atomlab 500 Dose Calibrator with the Atomlab Wipe Test Counter and create a complete, efficient and cost effective radioactivity measurement system... the Atomlab 500Plus. Consider the software that is supplied with the Atomlab 500Plus. It's comprehensive, easy-to-use and feature rich. The software mirrors the way you think and work. It guides when necessary, but does not burden the advanced user. The touch-screen and easy-to-follow on-screen prompts mean you won't need "cheat sheets." Resistance-Free Breathing: The injected bolus of xenon will reach the patient exactly when desired. Oxygen may be added to the system any time during the study with the press of a button. An in-line cartridge containing Soda-Lime absorbs CO2, preventing acidosis. Large breathing passages, two 10-liter breathing bags (air-in and air-out) and motor-assisted airflow combine to provide resistance-free breathing. Simple to Operate: All three steps of a Pulmonex® II study (start up, equilibrium imaging and washout) are controlled by a single valve handle on the front panel. The valve directs the motor-assisted flow of gases throughout the system. A manually adjusted 15-minute timer initiates all functions, then automatically shuts down the system to complete the study after patient and system washout. 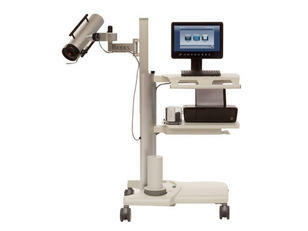 With controls conveniently located on the front panel, the user can operate the system and observe the patient and gamma camera from one position. Panel controls are clearly marked for each mode of the procedure with large viewing windows to make it easy to monitor the patient's breathing. A trim, clean design, large handles and total mobility permit easy positioning of the system for studies in both seated and supine positions. 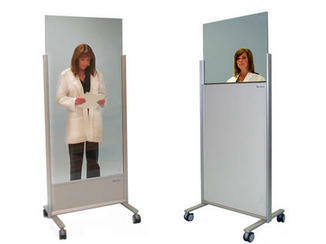 Introducing Clear-Lead™ – lead acrylic mobile x-ray barriers, featuring the first design change in thirty years. These barriers are for use around any imaging procedures using ionizing radiation, e.g., fluoroscopy, x-ray, CT, mammography. Handle-grab edges and large casters make them effortless to maneuver. Clear-Lead™ Mobile Barriers offer large, durable and shatter resistant protection wherever it’s needed. 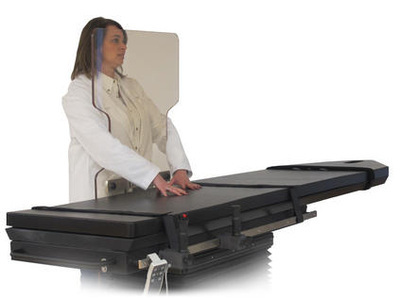 The unique hour-glass contour of the NEW Personal Mobile Barrier provides “hands-on” patient access while providing radiation protection (0.5 mm LE) where it’s needed. This versatile, lightweight barrier offers the distinct convenience of height adjustability (10.2") to protect the user, whether seated or standing. This feature is an essential advantage for all urologists, anesthesiologists, pain-care physicians, x-ray technologists and more. 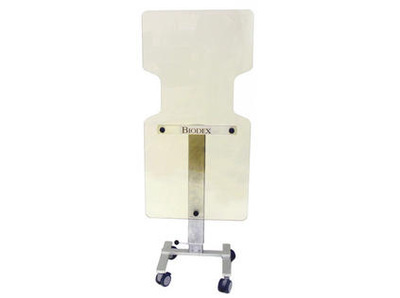 Constructed of Clear-Lead™ acrylic, the window measures 24" wide x 48" high with anatomically positioned cutouts for the user’s arms to maintain continuous hands-on contact with the patient while maximizing protection. Biodex Lead-Lined Laboratory Furniture is compact, attractive and offers benefits and options targeted at improving departmental efficiency and safety. Choose the appropriate shielding thickness to satisfy your particular radiation safety needs. 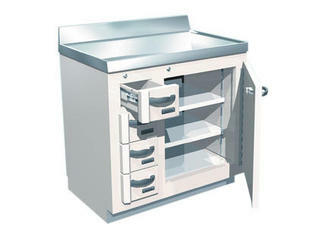 Mix and match cabinets to improve workflow and procedural efficiency.